This small Streamer pattern works well in the Spring in Michigan. 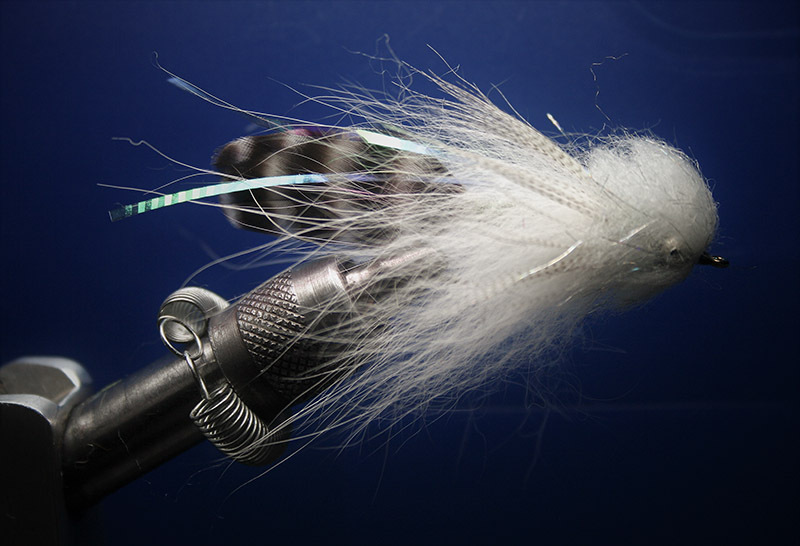 This fly represents two very important baitfish patterns in the diet of our cold water fisheries in the Great Lakes Region. The Salmon Fry and the Smolt pattern. In the Spring thousands of wild King Salmon fry hatch in the Pere Marquette River. These small minnows become a huge staple in the Brown and Rainbow Trout’s diet until the insect hatches begin. These fry sit along the banks in huge numbers allowing Brown and Rainbow Trout to slam them in the shallows. Almost like witnessing a blitz in salt water where a big fish is attacking the bait. In the Spring the Smolt of these King Salmon and Steelhead of two years of age, start to school up to make there long migration back to Lake Michigan following the adult Steelhead after they spawn and head out to the Lake. These become a big piece of protein for a giant Brown and Rainbow Trout as they try to ambush them on there way out of the river system. Another major food source for our resident Trout is Sculpin’s. The Pere Marquette River and other Great Lakes tributary’s are full of these baitfish. You can find them hiding everywhere, especially rivers full of woody debris. Tail two soft grizzle hackles tied in Matuka style off the back of hook. Body Green Caddis Ice Dub , dubbed towards front of hook putting more on towards front to form a shoulder. Wing Tie in reverse Artic Fox White. fray out with fingers and pull over Ice Dub shoulder. Two strands , one off each side of Lateral Scale Pearl (1760 is the number). Collar Tie in natural Mallard Flank tip first palmer towards eye of hook. Eyes Medium Silver Bead Chain Eyes. Head Clump on Senyo’s Laser Dub Silver Minnow Body to form head, trim and form with scissors’ around Bead Chain Eyes. Tie off and whip finish.